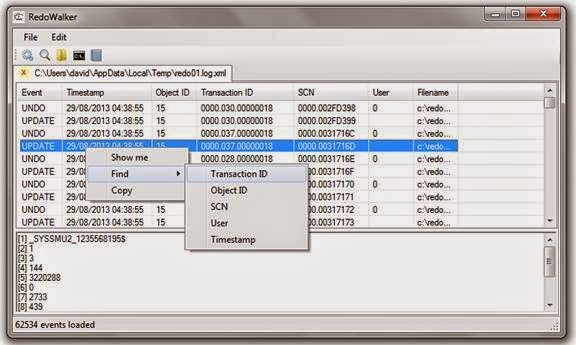 RedoWalker is a tool to explore Oracle database transaction logs, otherwise known as redo logs. Any time changes are made to the database server, for example after an INSERT, DELETE or UPDATE, they are recorded in the redo log. These redo logs are stored in a proprietary and undocumented format and, as such, are unreadable and unintelligible without a tool that can decipher them. Oracle does provide a tool called LogMiner to access the redo logs but to use it access to a live database server is required. RedoWalker is a replacement for LogMiner and removes this requirement. This is particularly useful for auditors, forensic examiners and breach investigators. DBAs can also take advantage of RedoWalker for troubleshooting and problem isolation without the database server; using LogMiner could cause the database server to slow down. RedoWalker dumps Oracle redo logs to an XML format; it specifically dumps redo entries fro DDL, INSERTs, UPDATEs, DELETEs and associated UNDO records. RedoWalker runs on Windows and requires the .Net Framework. Should work with Oracle 10g, 11g and 12c.